...Grundfos Pumps & Agriculture Solar Powered Water Pump Power Increases Efficiency, Lowers Costs and Maintenance. More crop per drop. Wherever Grundfos Pumps and Agriculture Solar power systems are used on a farm, Grundfos can design a pumping system that enhances productivity. Our objective is to make it simpler for you to get more crop per drop. No matter how big or small the application, we can deliver the necessary pressure and flow. • keep productivity at its highest. Grundfos Pumps and Agriculture Solar powered water pump power can supply irrigation pumping solutions that reduce energy costs, safeguards the water resource, and keeps productivity at its best. Our pumping expertise and technology ensure balanced dispersement despite varied conditions. 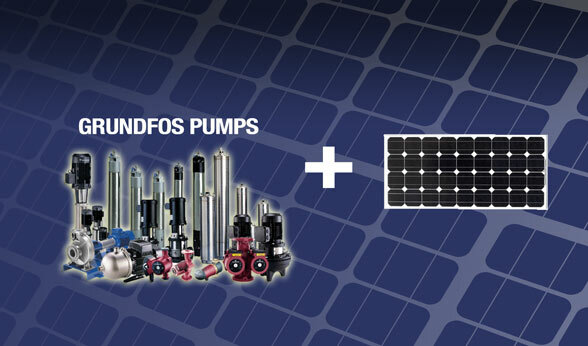 Grundfos Pumps and Agriculture Solar offers the industry’s broadest line of irrigation pumping and power systems. Our pumping power systems are efficient, tested for reliability and designed to work seamlessly with modern farming operations. No matter how big the application, Grundfos Pumps and Agriculture Solar can supply the necessary pressure and flow for every type of agricultural irrigation. Our pumps and power supply easily integrates controllers automatically that react to changing conditions and demands to keep running costs down. Each component in the system is pre-engineered to work seamlessly with the next. At Agriculture Solar, Grundfos Pumps and Agriculture Energies can be your simple water pump solution. Water distribution is about delivering water to the crop using various techniques, such as pivots, sprinkler irrigation or drip/micro spray applications. Maintaining correct pressure and flow in the pipes and at the nozzle means more water per kWh and savings on energy, which is one of the highest cost items in farming. Pump and Power control also safeguard the reliable flow of water by protecting the pump from dry-running, motor breakdown or power supply irregularities. Agriculture Energies systems have been dedicated to modern agricultural irrigation and successfully active in the top irrigation fields for over 10 years and continues to bring the tried and true principles and advantages of solar hybrid power. Think about it, and then make your move. Let Grundfos Pumps and Agriculture Solar water management provide you with decades of reliability and lasting value. We invite you to explore the possibilities of our reliable hybrid solar powered pump solutions.